Ancient Quest of Saqqarah is rated 4.6 out of 5 by 48. Rated 5 out of 5 by Zandora from This is the Best Match Game I am sorry I gave Imperial Island five stars. After playing this game Imperial Island is no longer a great game. The game is loud but you can adjust the volume. Unlike other M3 games this one gives you a variety of M3 puzzles to work on. Each one is in a different temple. As you do so the Statues of the gods turn into gold. There is also a great variety of goals to work for that keep interest going. The only one that is almost impossible is to play the game 40 times in a row. I made it to 25 (silver) and that took almost a day. Each goal has three levels stone, silver, and gold. The rest of the goals are more achievable as the score is added over different sessions. The game has excels in letting you stop at any point. You can even save a game in the middle and come back to it. This is Dream Vacation (solitare) for M3 players. Love the Blue Ape who comes to your aide with magic. The only puzzles he doesn't help you with is the logic puzzles. The game also has a nicely paced increase level in difficulties. Trust me this is truly the only match game you need. Rated 5 out of 5 by melissa845 from Great Game for Match Three Enthusiasts I wish I had more games like the Ancient Quest of Saggarah. I was not able to do the logic puzzles but completed the main game more than once. This is an excellent (and funny) Match Three. 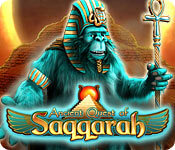 Rated 5 out of 5 by Skipstir from Ancient quest of saqqarah Awesome ! Awesome ! Awesome ! I love this game. Very challenging and alot of fun at the same time. Rated 5 out of 5 by tap6511 from You Won't Get Bored With This One I loved the variety of games all in this beautiful game. It is challenging and so so fun! I only wish there was a sequel. They made it seem like there might be one, but they haven't made one yet. Bummer! It is really that good. Rated 5 out of 5 by TabithaMoon from Best Match 3 / Mixed Puzzle Game I have had this game since 2012 and I am STILL playing it! And STILL loving it! 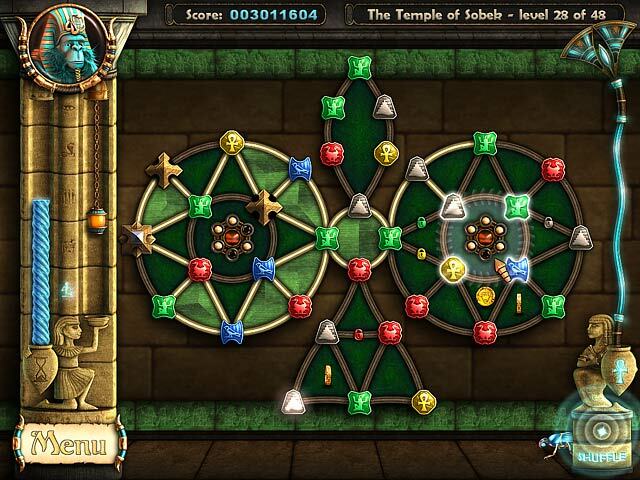 So there are several major Egyptian god/goddess temples to restore, which is done as you win each level. There are 3 levels of difficulty that you graduate to as you pass all 12 stages within each difficulty level. I am finally on the 3rd and final difficulty level for all temples. 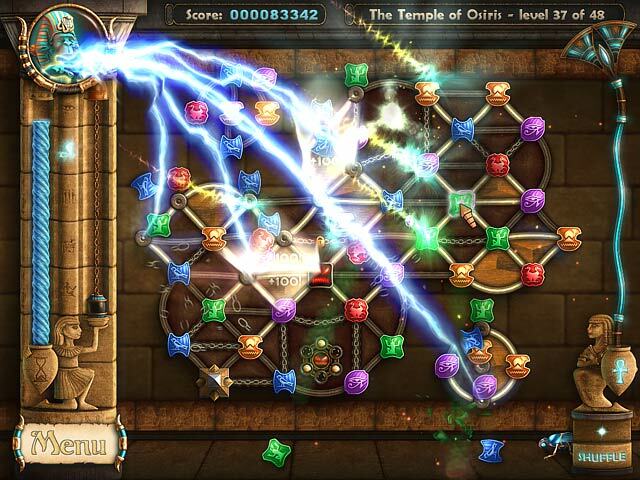 Each temple has a different type of Match 3 board and puzzle. 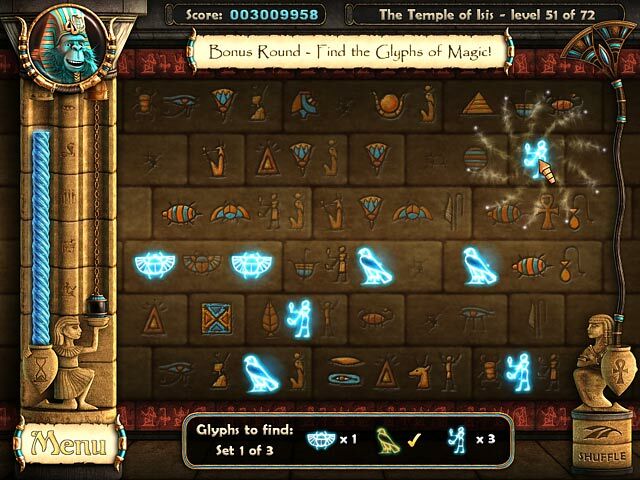 Between each set of stages are quick hidden object scenes where you have to find the hidden hieroglyph on the wall of multiple hieroglyphs. This is timed but it isn't so hard that you'll run out of time. I never have. The gods and goddesses speak to you as you enter their temple, as you pass a stage, and as you leave their temple. It's just a brief greeting or word of encouragement or goodbye. If you fail a stage, they offer words of encouragement. I love the voices! They are so appropriate to each god/goddess. The blue monkey can be annoying at first but he grows on you. I don't like monkeys in real life, but I'm very fond of this one! During game play, you earn points that enable Shuffle and get the monkey to strike the board to help you out. He adds power up gems and he even clears areas of the board that have been difficult. He has saved me from running out of time on numerous occasions! There are trophies/awards that you earn and are displayed on the primary game board. They are beautiful and change according to the level up you just encountered. In fact, the whole game is beautiful. The designers really went above and beyond on this one! And now that I find myself on the final level for all temples, I am feeling a bit sad that it's almost over. This has always been my go-to game when I need to relax, when I just don't want to play a HOG, when something is bothering me in my daily life and I want to distract my mind. I HIGHLY RECOMMEND playing the demo to see if this is what you're into. If so, I would again HIGHLY RECOMMEND buying this game. If you are uncertain, use a free coupon code. You won't regret it! One piece of advice: Don't give up! I used to think I would never complete Thot's temple, and I decided not to go back and even try. Well, I did, and once I was through with the easy level, I found it wasn't as hard as in the beginning. If you stick with learning the rules of each board, you really won't be sorry. Plus, there are videos and walkthrough's online if you really get stuck. Rated 5 out of 5 by kc1959 from Mastered Madam Monkey Marvelous game. Challenging with each temple especially Temple of Thot! Enjoy! Hoping for a sequel!!!!! Rated 5 out of 5 by Cazpah from Want more than 1 style of match 3 in one game? YES PLEASE!!! Awesome just doesn't cut it! This game surprised me as I'd gone off of match 3 for quite some time. Not anymore! Now I find myself looking for anything remotely similar to Ancient Quest of Saqqarah! My fav is the swapping tiles room! Rated 5 out of 5 by pgobeli from Incredible I usually go for the HOG's but every now and then, I switch to M3s as a diversion. This game is exceptional. The soundtrack (which is vital because you hear it all the time) is fabulous. The Monkey is truly funny. And the voice overs of each god is almost perfect. Did anyone else fall in love with Anubis? The puzzles are diverse and clever. You can play timed or untimed. The Temple of Thot was the most difficult for me but I am sure it gave my brain cells a good workout. This game is seriously addictive and will be the best Match 3 game you have ever played. Rated 5 out of 5 by bcmanx from best match 3 game this game was the best game I have ever played, I can play it over and over and not get bored. Rated 5 out of 5 by lynnisrich from Fun Game This is a great marble popping game. Its got plenty of challenges.The backgrounds and sound effects are great.I love it playing it.